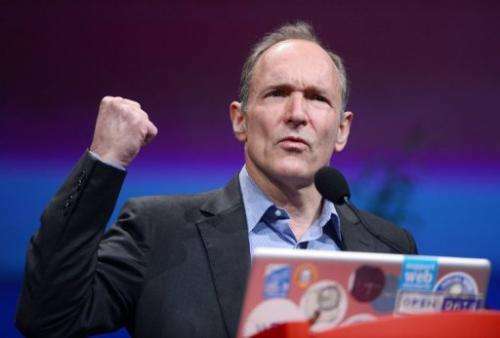 The inventor of the World Wide Web warned Friday that government control is limiting the possibilities of the Internet, as dozens of countries and businesses signed a cybersecurity deal at the Davos forum. The comments by Tim Berners-Lee at the World Economic Forum plugged into a wider debate among the delegates on the future of the Internet, particularly how to balance openness with privacy and security. While Yahoo! chief Marissa Mayer told the forum there was a "trade off" between privacy and the benefits of increasingly personalised services offered by Internet giants, the network's founding father took up the ethical issues at stake. "The dream is of a more open web," Berners-Lee told the gathering in the Swiss ski resort, citing social media as a way of breaking down barriers. But he said the recent suicide of Aaron Swartz, a 26-year-old US Internet activist who faced charges of illegally copying and distributing millions of academic articles, highlighted government efforts to police the Internet. "He downloaded a lot and so the secret service in the US decided that he was a hacker. For them that isn't the term of great praise that it is when I use it. For me a hacker is someone who is creative and does wonderful things," he said. Berners-Lee—who launched the first web page on Christmas Day 1990 and is is credited with creating the World Wide Web—called on international governments to release more data, saying that others could use it to find solutions to problems including economic and health issues. "They can give you 101 reasons for not doing it but it comes down to control," the Briton told the forum. But Yahoo! CEO Mayer had a different take when it came to data about individual users held by companies such as hers and by other Internet giants such as Facebook and Google. "I think that privacy will always be something that users should consider. But I also think that privacy is a trade off," she said. "Because where you give that personal information you get functionality in return." Mayer, 37, who took over in July at Yahoo! after 13 years at Google in a move aimed at reinvigorating the faded Internet firm, said the future lay in the increased "personalisation" of the web. She predicted the dominance in coming years of handheld Internet devices to take personalised content. But she added: "The real question is making money from it." Joichi Ito, director of the Media Lab at the Massachusetts Institute of Technology, said the Internet worked best when it was governed only by the needs of individual users and communities. "The Internet is a bunch of humble little small pieces loosely joined. There's no one on the Internet that tries to control the whole of it," he said. "When you're in a network and you've got YouTube and Facebook and you've got all these other things, lots of little features together make the whole work." For government leaders at Davos the topic was about how to harness the power of the Internet to boost the global economy—while also maintaining security against fraud and terrorism. More than 70 companies and government bodies officially signed up to the World Economic Forum's new "Cyber Resilience" principles on Friday aimed at tackling the issue. Speaking at Davos on Friday, British cybersecurity minister Francis Maude said a "safe and secure" Internet was necessary to help business thrive. "Cyber security is a shared, global challenge—our companies operate in a global marketplace. The cyber threat knows no geographical boundaries and it matters that those we connect to are secure as well," Maude said. Separately Neelie Kroes, the European Union's telecommunications commissioner, was at Davos to appeal to companies and governments to improve the technological skills of young Europeans to compete with the rest of the world. Berners-Lee agreed, saying that the world economy needed "more people who can program" and that in the Internet age children should be taught how to use computers from an early age. But he added: "Computers are important, but young people should study history and art and music and things." Well, duh, it's the government. They typically screw everything good up.
" government control is limiting the possibilities of the Internet, "
Too bad that's all he is worried about, but its a start. Really, that's not the "real question". Sometimes value is not expressed in monetary gains. Libraries don't make profits but they avail people of knowledge. The internet is very much like a library in some aspects and a shopping mall in others. Either it's subsidized by taxpayers or donors like a library, subscribers which is usually very limiting or sponsors also very limiting or each business gives a percentage of their profits to maintain but not control. Computers are important and now a days internet is very important one that every needs it. We can gain and develop the knowledge through the internet. Sometimes value is not expressed in monetary gains. Someone still has to pay for it. Libraries are funded from plundered wealth. Internet servers require electricity, maintenance, replacement, and communication links to users whether cable, cell, DSL, ...all must be paid for. Plundered wealth? You need to take your Ayn Rand nonsense somewhere else. Public and private enterprises should compete like they always have. It's clear that they both have their places.